Almost 75 miles separate Westfield and Bosham football clubs and the distance certainly gave Westfield a big helping hand yesterday (Saturday). 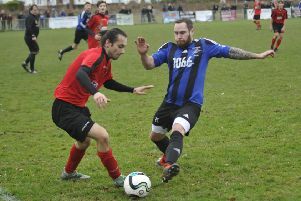 The Westies struck twice in the opening 11 minutes while Bosham were playing with nine men as they waited for their final car to arrive, paving the way for a 2-1 victory. After kick-off was delayed by around 15 minutes, Zac Hurst blasted Westfield into a ninth minute lead with a terrific left-foot shot from 25 yards which left the goalkeeper rooted to the spot. Hurst was also credited with the second goal two minutes later when Jack Whiteman’s cross from the right was contested by several players and the ball ricocheted into the net. Both teams then had a man sent-off. Westfield wide player Khaya Nyathi saw red for his angry reaction to a foul by Andy Probee, who was also given his marching orders. With Bosham now down to eight, it looked a case of damage limitation for them until Alex Barnes latched on to a throughball and slotted home to make it 2-1 in the 18th minute. The visitors’ latecomers took to the field in the 25th minute. Bosham had the better of the play thereafter and must surely have left wondering what might have been had they started with the full compliment. Bosham hit the crossbar and post during the second half of the Macron Store Southern Combination Football League Division Two fixture, the latter a great strike by Barnes from around 35 yards. Barnes was also denied by debutant Westfield goalkeeper Joe Cullip when clean through and Cullip produced a great save from James Wilson’s volley in added time. Westfield: Cullip, Benton, Durrant (Warren), Paine, Dicken (Cook), Dadswell, Hurst, Ward, Ugebe, Whiteman (Martellini), Nyathi.